Experienced humans and horses to support your riding and training needs. Allison Howson founded Forte Farm in 2009 to provide individualized quality education for horse and rider. She has a degree in Equestrian Studies from the highly respected University of Findlay where she was a member of their National Championship Equestrian Team. Upon graduation she went to work for the University of Findlay, managing and operating their Centennial Farm Equestrian Center in Grosse Ile, Michigan. As a professional since 2001 she has coached students to Championships and year end awards from the local MHJA shows to "AA" rated USEF shows. She has taught at programs large and small, and what she found is her Forte is taking the time with each individual to help them achieve their goals. Twister is 34 years old and is the consummate professional. His years of experience as a lesson horse help him discern what his rider wants him to do even if they are not yet sure how to ask! From the first time near a horse to jumping around courses, he takes excellent care of his riders. Occasionally he travels to horse shows with his young riders. He is adorable, fuzzy, and patient. Kids can't get enough of him! Chubby joined the team in 2010. He can teach riders from their very first lesson to their very first show! He is a 18 year-old pony hunter. In 2012, he qualified for USEF Pony Finals by winning champion at his second "A" show! He also showed in the Short Stirrup division. He teaches riders a good position and correct use of their aids. Because he is "kick along" quiet, he helps riders build confidence. He is stylish and has a lead change which helps teach riders the correct feel and prepares them for horse showing. 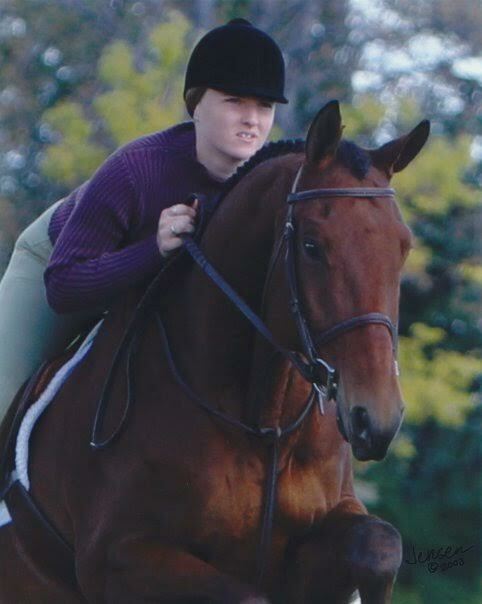 Piper is a 17 year-old warmblood who joined the team in 2012. She is steady and consistent, giving riders time to think about the skills that they are working on. She has an automatic lead change, a very quiet nature and lovely canter. She is the rare combination of forgiving teacher who can work patiently in the school program, and get tuned up to win ribbons at the shows. She tries her best every day, at every job! Penny is super forgiving and very tolerant of rider mistakes. She safely teaches rides correct use of aids and solid position. She is a wonderful first horse to jump on! She is 13 years old and joined the team in 2017. Her skills continue to grow and she will be attending her first horse shows in 2018. Is a horse show professional. She has all the bells and whistles that earn the ribbons at shows and is a kind teacher who helps students get a taste for horse showing. Polly was born in 2005 and has taught many young riders coming up the levels. What a gem!